This ooey-gooey Chocolate Chip Cookie Ice Cream Sandwich Recipe is the perfect treat for those hot summer days! I love baking. I love baking with my daughter even more. 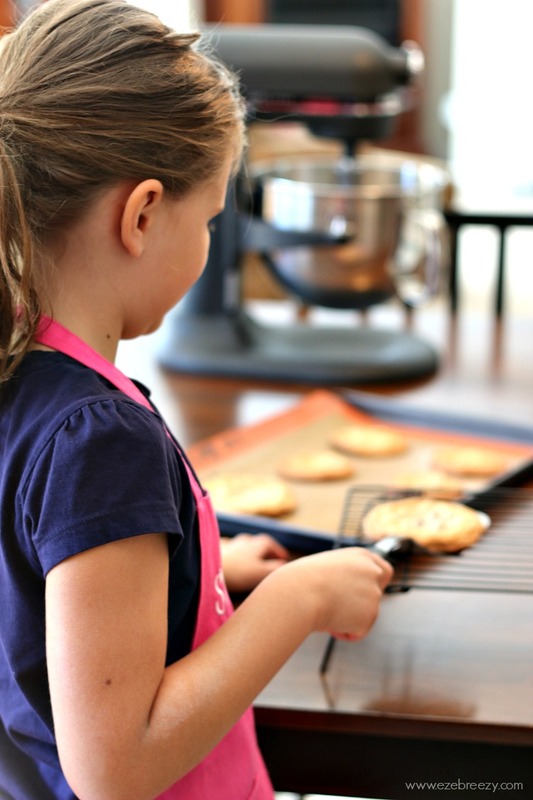 Now that she’s home from school, we will be baking up a storm in the kitchen this summer. One of the things on our bucket list this summer is to bake together once a week. 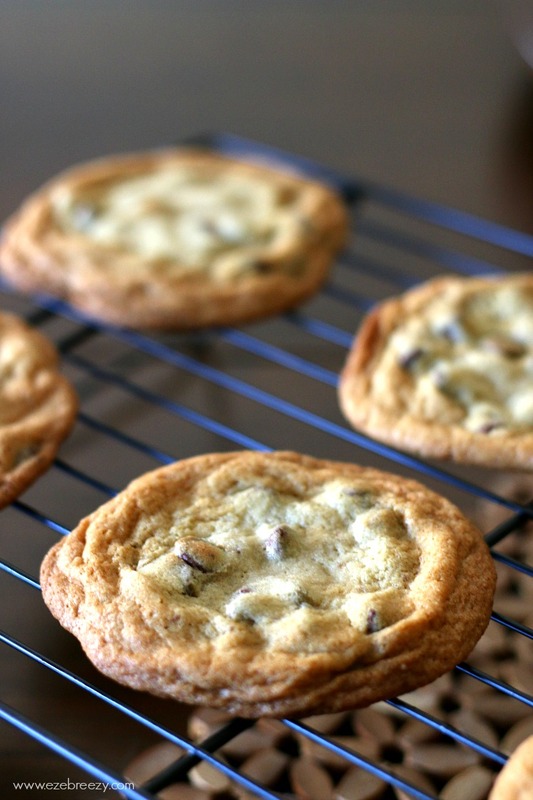 We decided to kick things off by making one of our favorite cookies – Gooey Chocolate Chip Cookies. But this time, we are transforming them into irresistible Ooey-Gooey Chocolate Chip Cookie Ice Cream Sandwiches. Yum! Before things could get baking in the kitchen, we needed to head out to one of my favorite places to stock up on things for the house – Costco. We stocked up on Dawn Platinum Advanced Power, Bounty Advanced, and Cascade Complete Action Pacs from Procter & Gamble, everything we needed to clean-up after we made these delicious, yet messy (but so worth it) cookie ice cream sandwiches. 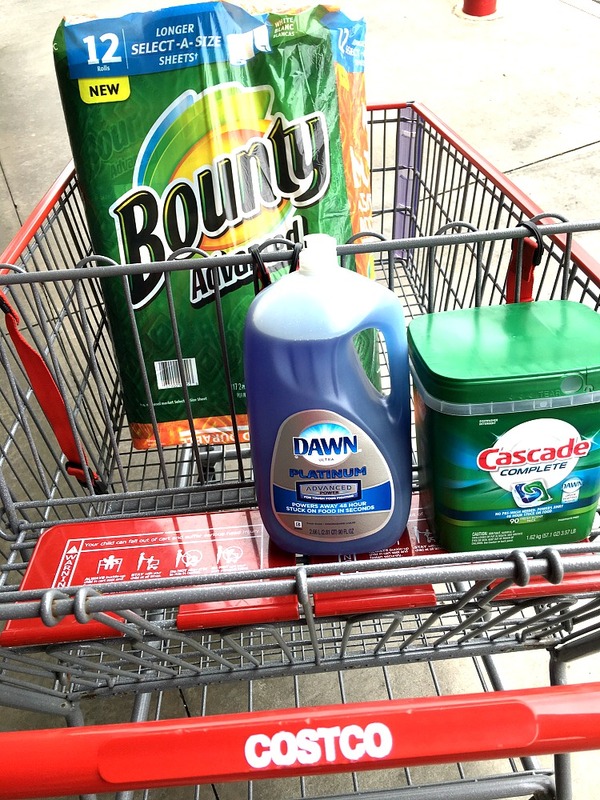 The details matter and these products will make a big difference when it’s time to clean up. Now back to the baking. The foundation of these ice cream sandwiches are made from delicious, soft, gooey chocolate chip cookies. You’ll find the recipe down below. The key to achieving the perfect soft gooey texture is to not over-bake the cookies and pull them out as soon as the edges are slightly browned. The cookie recipes call for the dough to be chilled for 45-60 minutes – the cookies bake up much better this way. 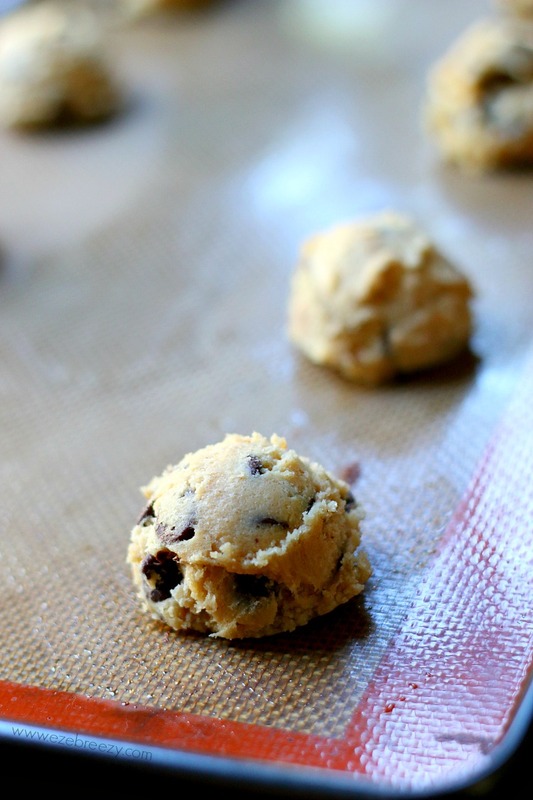 Drop the cookie dough onto a lined cookie sheet and bake for 9-12 minutes. Cool on cookie sheet for 5 minutes before transferring to the cooking rack to cool completely. This is what you call cookie perfection! While the cookie dough chills in the refrigerator, we like to get a jump on kitchen clean-up. But I have a confession to make. I am TERRIBLE about rinsing off my dishes before putting them in the dishwasher. Thankfully, I found that with the Cascade Complete Action Pacs and the power of Dawn, I don’t even need to worry about skipping that step. My caked on cookie dough is no match for the Cascade Complete Action Pacs. It really is the tougher tough food cleaner. Some things I use in the kitchen aren’t dishwasher safe and that’s where my little helper comes in handy; she’s a great washer. We have used Dawn Platinum Advanced Power in our kitchen for years. I even keep a little soap dispenser full of Dawn next to the sink. This little detail makes washing dishes so much easier because I have soap right when I need it. 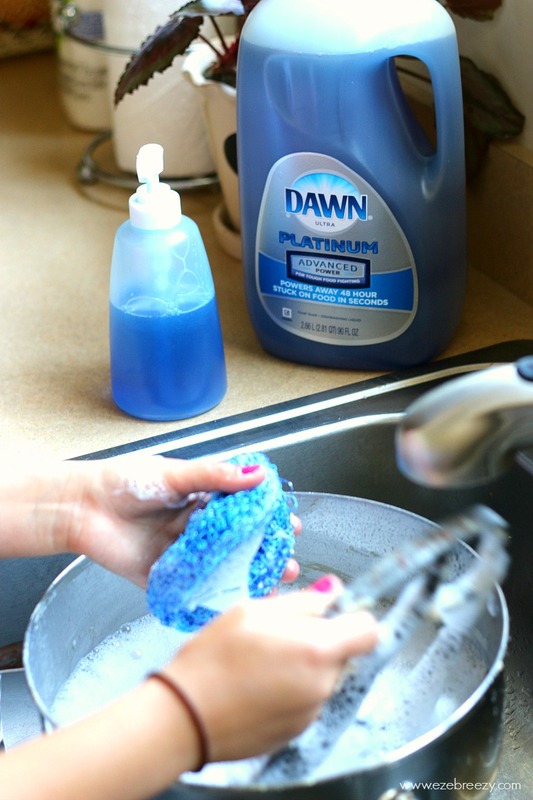 I love Dawn Platinum Advanced Power because it delivers the power of an overnight soak in the sink, in just seconds. This soap makes it so easy to clean-up the kitchen; even a kid can do it. 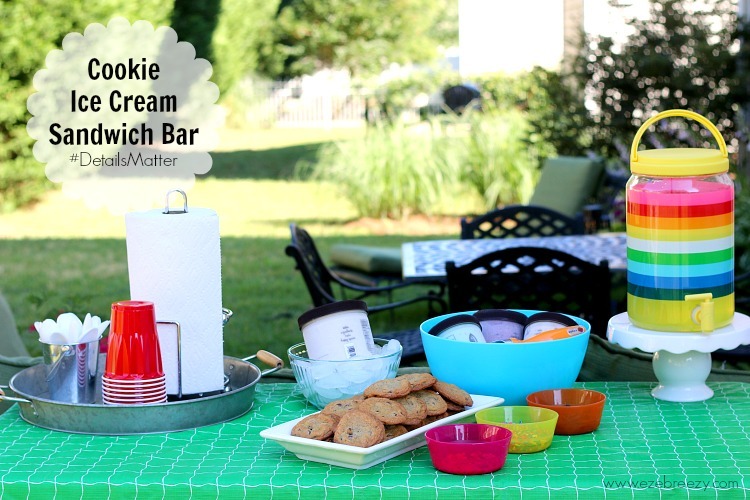 Now that the kitchen is clean, it’s time to get things set up for making the ooey-gooey chocolate chip cookie ice cream sandwiches, and what better way to assemble these ice cream sandwiches than at a fun backyard ice cream sandwich bar! Pick 3 or 4 “add-ons” for your cookie ice cream sandwiches. These little treats are going to be rolled onto the side of the cookie ice cream sandwiches. 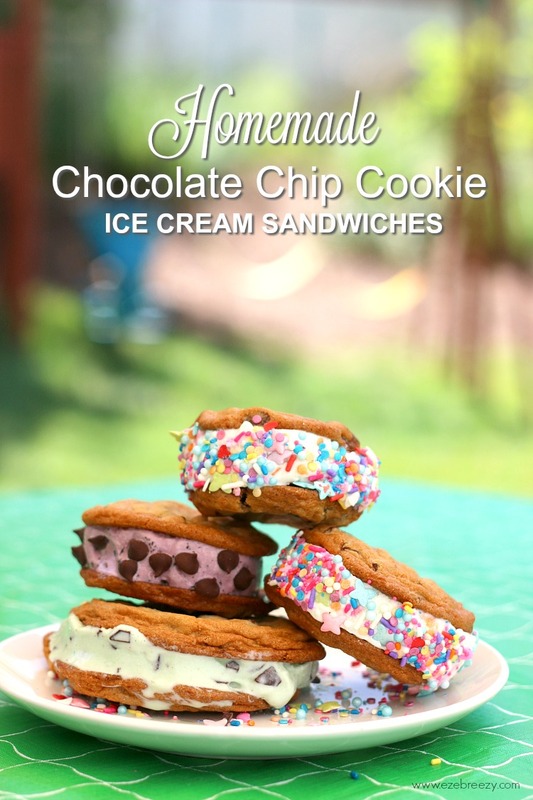 That’s right…we are taking these ice cream sandwiches up a notch or two. 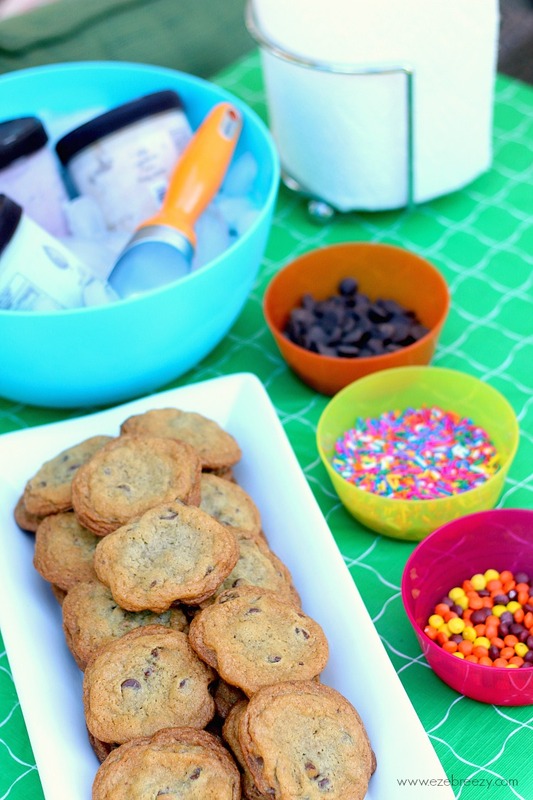 You can use anything for add-on like sprinkles, mini M&Ms, chocolate chips, Nerds candy, candy bits of any kids. You are just limited to your imagination. There are several ways you can transfer the add-ons onto the side of the cookie ice cream sandwiches but rolling the sandwich into the toppings is what I have found works best. Lay a Bounty Advanced paper towel down on the counter and spread out a layer of your candies. 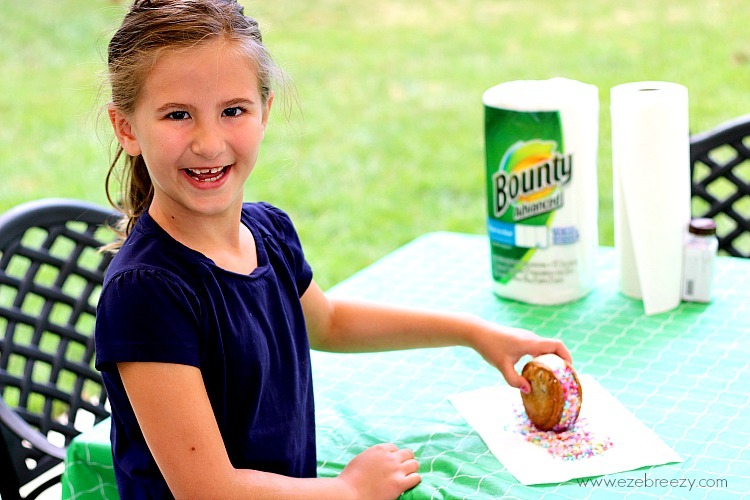 The Bounty Advanced super absorbent paper towels work perfectly for this part; they are super strong and durable. Pick the cookie ice cream sandwich up (don’t be afraid to get a little messy) and roll the side into the add-ons. **TIP** The ice cream can get soft so put the ice cream sandwiches in the freezer to setup for about 15 minutes before eating. 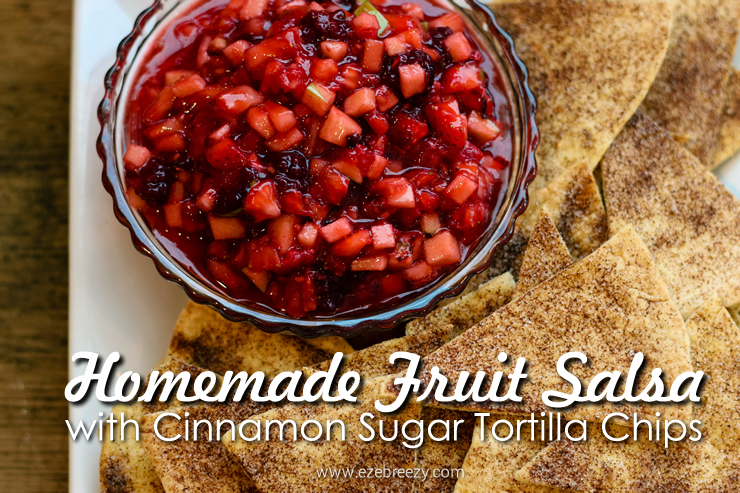 When they are ready to eat, wrap the bottom half in a paper towel and enjoy! I mean look at this! Chocolate Chip Cookie Ice Cream Sandwich perfection. 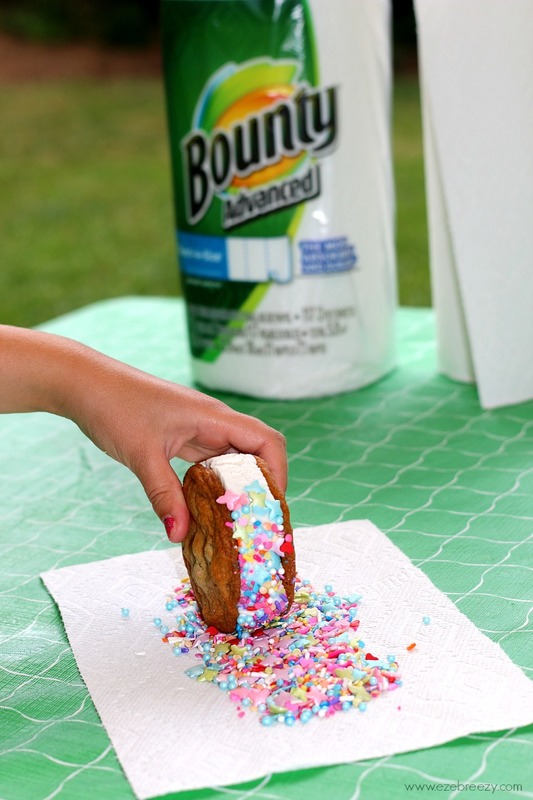 And now look at this….this is why we keep durable Bounty Advanced paper towels on hand. Someone couldn’t wait that long. 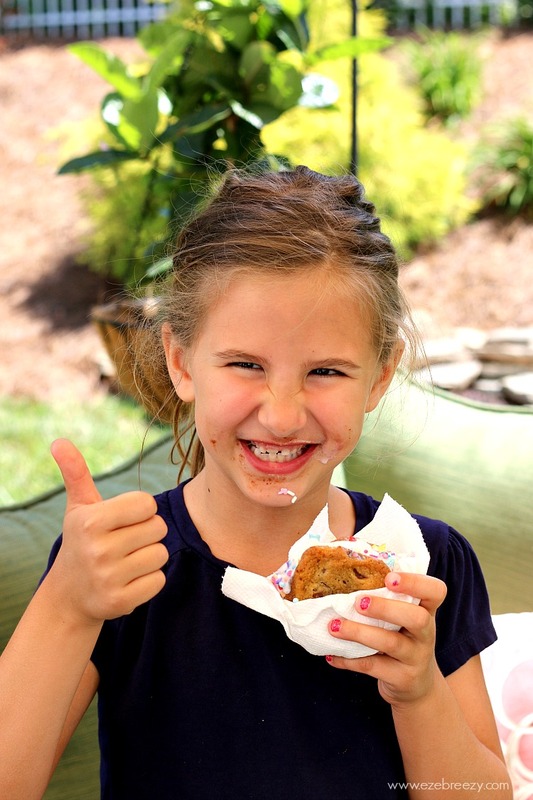 I think these Chocolate Chip Cookie Ice Cream Sandwiches were a big hit! Preheat oven to 375 degrees. Line cookie sheet with silicone baking mat or parchment paper. 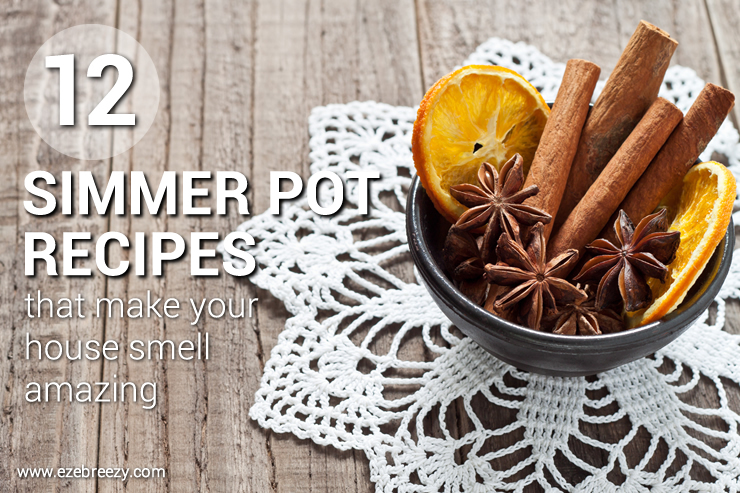 In a medium bowl, combine flour, baking soda, baking powder, and salt. Whisk dry ingredients together; set aside. In a large bowl, cream together butter and white and brown sugars. You can use a stand mixer with the paddle attachment or a hand-held mixer. 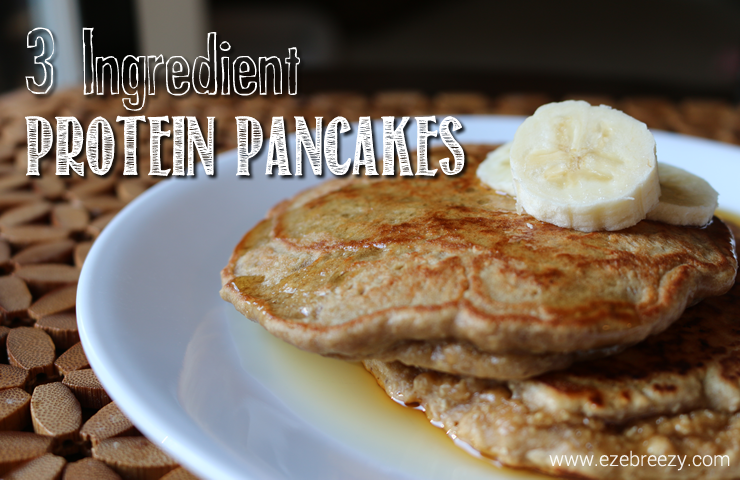 Add vanilla and eggs (one at a time) and mix. Scrape down the sides of the bowl as needed. Turn the mixer down to low and slowly add the dry ingredients. Mix until the dough just comes together. Do not over mix. Finally, add in the chocolate chips and mix until incorporated. Place dough in refrigerator for 30-45 minutes to firm up a little bit more. Place heaping spoonful of cookie dough on the lined baking sheet. I used a tablespoon cookie scoop. Bake for 9-12 minutes (baking time varies depend on oven) until edges are a light golden color. Cool on baking sheet for a 5 minutes than transfer to cooling rack. Once completely cooled - assemble chocolate chip cookie ice cream sandwiches - see directions in below. Soft ice cream of choice on counter for 5-10 minutes. 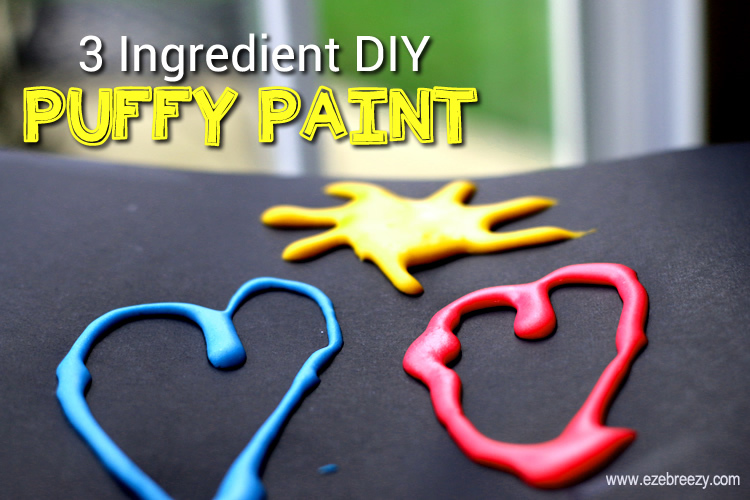 Lay out a few paper towels on the counter and spread a layer of your add-on toppings across the sheet. Place 2 scoops of softened ice cream on 1 cookie. Place a second cookie on top of ice cream and press down. Stop when ice cream starts to spread out the edges of the cookies. Hold cookie in hand and roll the sides on ice cream sandwich in the add-ons, coating the side of the cookie ice cream sandwich. Place coated cookie ice cream sandwich on baking sheet. Repeat this process with each of the different add-on toppings. Once all cookie ice cream sandwiches have been made, place baking sheet in freezer for 10-15 minutes for everything to firm up. Remove cookie ice cream sandwiches from freezer, wrap bottom half in paper towel and enjoy! I love ice cream sandwiches and homemade ones give you so many options. These look delicious! Kids love it. It’s so much fun! Love the idea of an ice cream sandwich bar. I have made them and froze them for parties but why not get the kids to do it themselves. perfect. The kids have a blast. It really is a fun activity to do this summer. Thanks for stopping by! Homemade cookies are the best, making them into ice cream sandwiches even better. 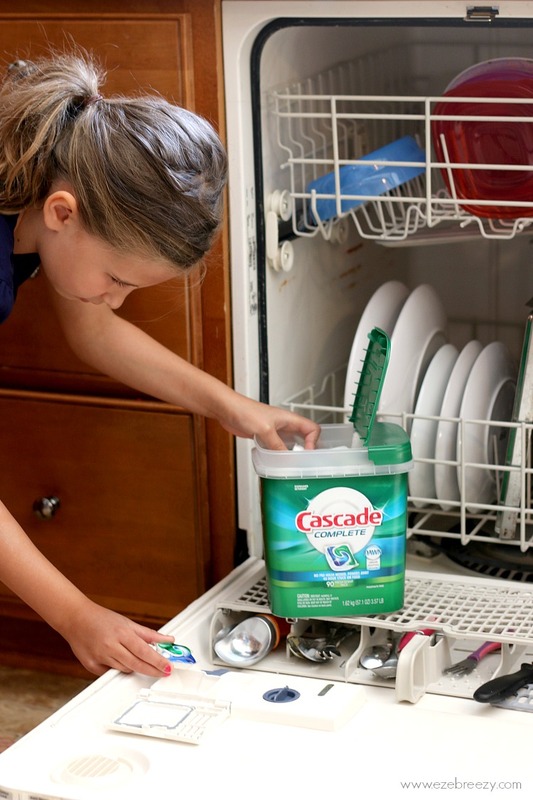 I see you use Cascade…..I happen to think that is the BEST brand, dishes always come out clean!! Thanks for stopping by! 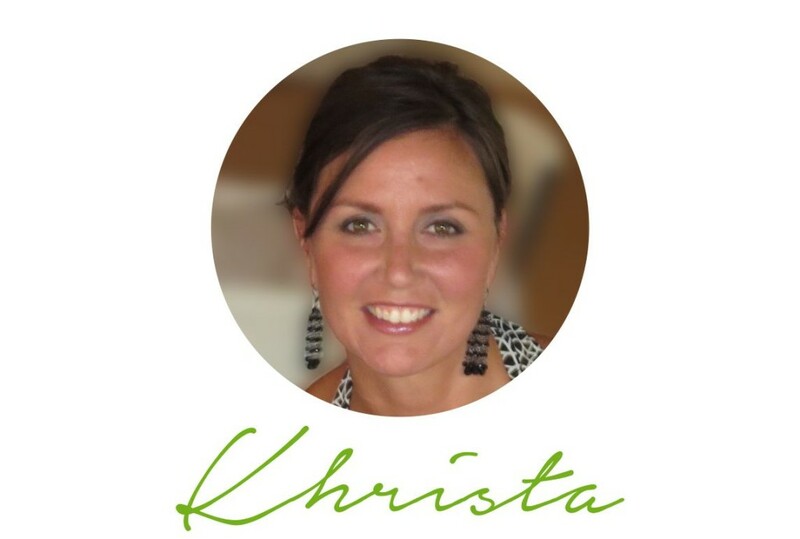 I totally agree – Cascade is the best. Yum! 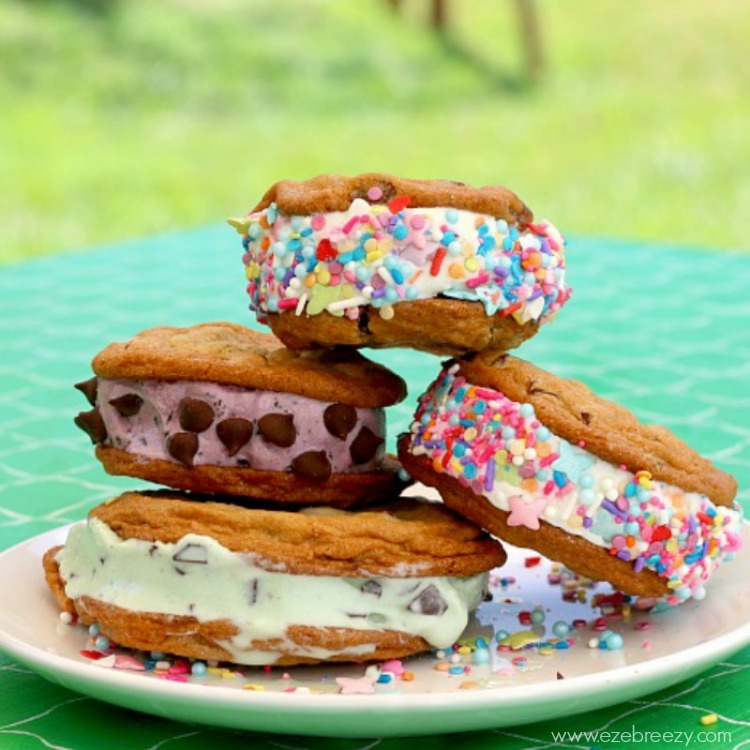 We love making ice cream sandwiches like this. They’re so delicious and perfect for summer. When I indulge I love an ice cream sandwich. These look like they beat your average blue bell by a mile!